Because a man can never have enough cool gadgets to play with, we’ve put together a list of several must-have gadgets for February 2018. You could say that the Echo Spot is yet another Alexa-enabled smart speaker that allows you to use your voice to control it and ask it various questions. You wouldn’t be wrong, but the Echo Spot does more than the original Echo, the new Echo Plus, or the compact and inexpensive Echo Dot. The main selling point of the Echo Spot is its circular touchscreen, which measures 2.5 inches in diameter and can display a clock, play a video, show you the latest news, and more. Above the screen is an integrated camera for video calls with other Echo devices and smartphones. Like all other Echo devices, the Echo Spot can control your other smart gadgets—provided they are Alexa-enabled, set times and alarms for you, help you plan your day or shop for groceries, and answer your questions. The Echo Spot is available in black and white and Amazon also sells it in a bundle with one smart bulb from TP-Link, so you don’t have to buy anything else to make your home smarter. Many have doubted the Nintendo Switch upon its release, but Nintendo has proven yet again that it understands not only its core audience but also games in general. Apart from a growing library of entertaining new releases, the Switch also has a virtual console that allows players to access free monthly Nintendo Entertainment System (NES) and Super Nintendo Entertainment System (SNES) games. But the one thing that the Switch doesn’t have is a proper four-way D-pad, just like the one on the original SNES controller. The good news is that the new SN30 Pro provides a great fix for this problem. The SN30 Pro retro gamepad has all the buttons you can find on the original SNES controller and a very similar button layout that is guaranteed to feel instantly familiar to everyone who has had the pleasure of playing on the SNES or the SNES Classic. The only difference is the addition of two analog joysticks. 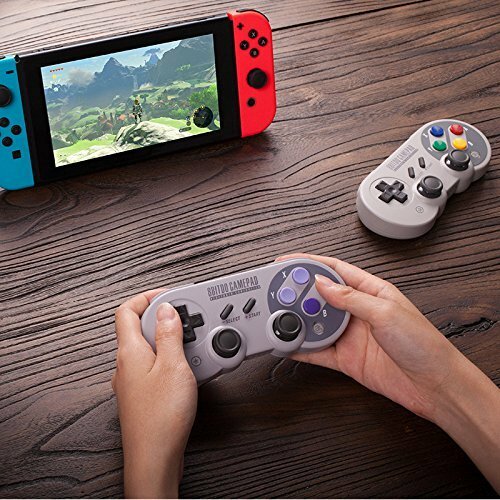 Thanks to them, the SN30 Pro retro gamepad is extremely versatile and suitable even for those Switch games that would be impossible to play with the original SNES controller. Get it here. Even though GoPro isn’t the only manufacturer of action cameras, it has the most influence, and every new product release from the company is accompanied by great expectations. But GoPro has a problem: how can it keep improving products at such a rate that consumers will remain interested in them despite the fact that there’s arguably very little room for improvement because products such as the GoPro HERO5 are already considered to be nearly perfect? Well, GoPro has found the way: slow-motion. The GoPro HERO6 is the first GoPro action camera to feature GoPro’s proprietary image sensor, the GP1. Thanks to this little wonder, the GoPro HERO6 can shoot 4K video at 60 frames per second and 1080p at 240fps. While the 4K slow-motion recording capabilities are impressive in their own right, it’s the ability to record 1080p video at 240fps that we expect to make a huge splash in the industry and usher in a tsunami of visually impressive video content from professional movie-makers and amateur content creators alike. Get it here. As far as we are concerned, every company that dares to stand up to Bose’s dominance of the noise-canceling market deserves respect and attention. JBL is already regarded as one of the best manufacturers of wireless headphones, so you have every right to expect their latest entry into the noise-canceling market to be excellent. Indeed, the JBL Everest Elite 750NC are comfortable over-the-ear headphones with up to 20 hours playtime on a single charge and active noise cancelation that goes a step beyond what the competition offers. Using the My JBL Headphones app, you can adjust the amount of noise cancelation to your liking, and the headphones will then automatically ensure consistency using several onboard microphones. The same app also allows you to tweak the sound profile of the JBL Everest Elite 750NC using a 10-band EQ or several available presets. Get it here.